In FLM, we want you to feel at home. We have a team of professionals that energises, manages and develops leisure and free time activities for the FLM users, suggesting resources and alternatives for the self-management of leisure time. 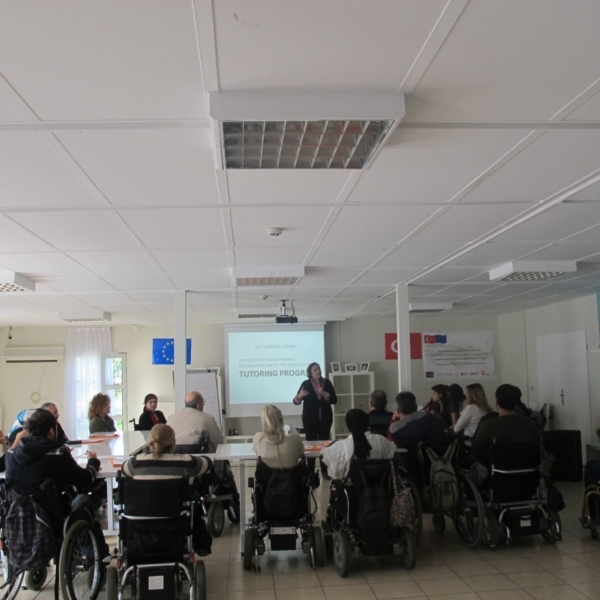 For this purpose, we develop a large number of free-access activities and have teams and groups that carry out continuous activities. Sign up now! Follow the FLM Sports and Entertainment Facebook page	to stay tuned for all our activities! A leisure option increasingly popular among the FLM people. We started with a team… And we already have two! It is a normalised leisure offer: what matters is what you want, not if you walk or you go on a wheelchair. In the Electronic Darts Workshop, you will be able to learn all the tricks and techniques to become a master of electronic darts eight hours a week. They will teach you to throw, to choose the darts, online games… and you will enjoy internal competitions during the trainings. It doesn’t matter what type of injury you have! We have adaptations for all sort of cases in our Specialised Care Group. In competition, we have the only two darts teams formed entirely by people with SCI. We are very strong in the electronic darts league of the Community of Madrid… And in our own league! 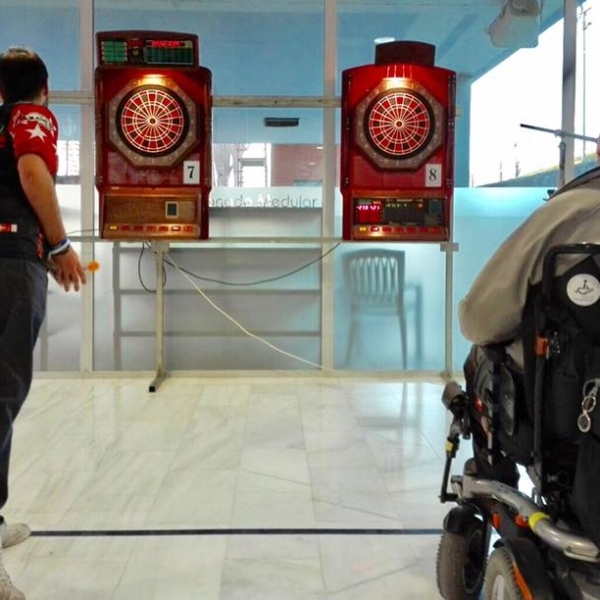 Every January, we organize the Inclusive Electronic Darts Championship in our facilities. A great plan for a Saturday afternoon, where dart throwers from everywhere, with or without disabilities, gather to compete for our prize. In 2018 we will celebrate our 10th. Championship, you’re still in time to join! Did you know that batukada is not only in Brazil? We have the only batukada of people with SCI in Spain! 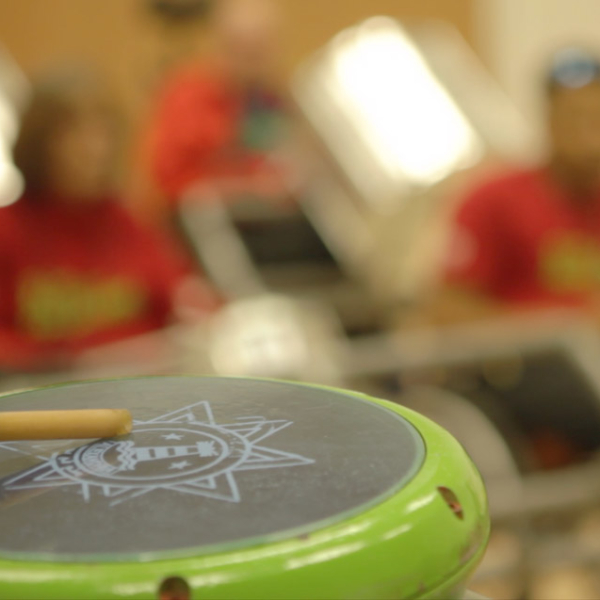 If you have rhythm and action and you are not afraid of doing a lot of noise, we have an extremely fun option for you… It is a matter of showing you have drums! We have developed a group called “BATUKANA FLM” for the last two years, doing various performances in social, institutional and party events. We have even performed on stages! We meet on Wednesdays, being assisted and supported by Batukada Rakatui (from La Kalle Association), and we have very good times with our mates, drums, agogós and, above all, a lot of rhythm. Not everything is going to be having fun! It is also important to be aware of the reality that surrounds us, besides our own. We have an English course running for several years. We have also enjoyed dance, singing bowls, yoga specialised in SCI… And now we are thinking about music. What would you like to do? We are open to suggestions so we can spend time together and acquire new skills. With us, you can attend the main art exhibitions, sports events, fairs and guided tours in Madrid and enjoy the best films in the outdoor hoarding… We have film screenings in the auditorium once a fortnight. There is a different theme every month (horror, comedy, musical, classics and action). Besides, we move the sessions to the patio in summertime, where we have unforgettable evenings! We celebrate parties in which the entire FLM and its friends participate. 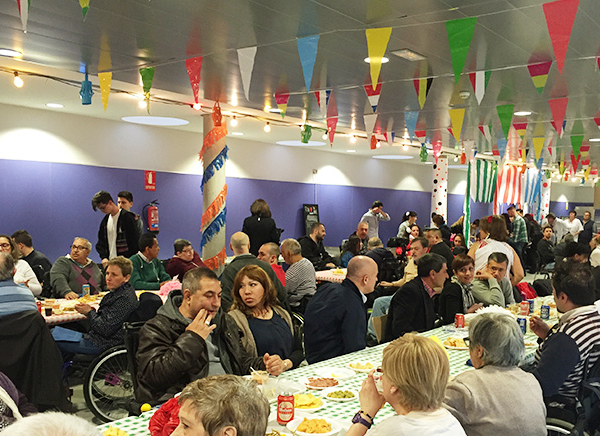 Enjoy our rebujito in the “Feria de Abril” (April Fair), or welcome summer with the FLM BBQ. And let yourself be soaked by our Christmas spirit during December… There are activities for every taste!